As I wrapped up the final costs of the trip I thought, “This is a lot of money for someone that doesn’t have much extra.” Aside for a few trinkets, we don’t have any hard assets to show for it. We don’t have a chunk of money now invested and accruing interest. We may very well say in ten years that “X amount invested at that time would be now worth X.” However, I can’t help but believe it will be the best investment we’ve made. That’s really what this trip was all about—investing in our family and our children’s education. 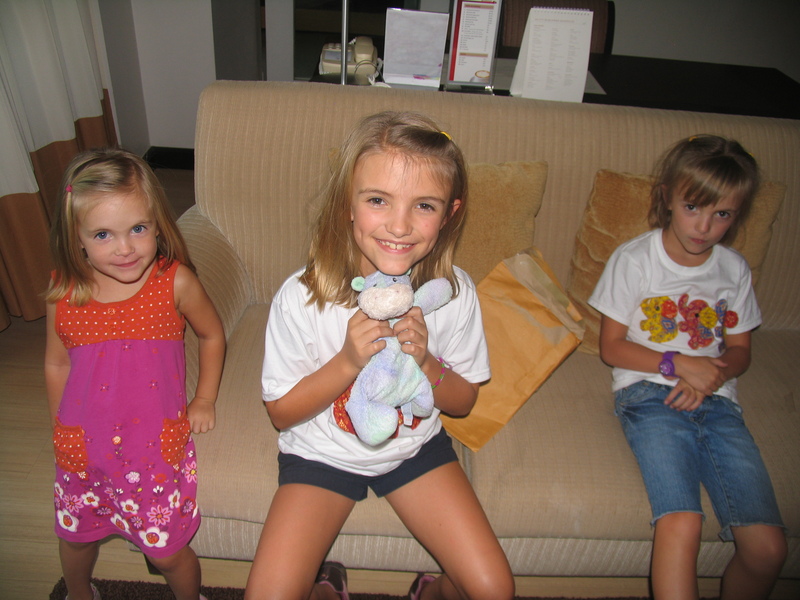 They seemed to grow up quickly on the trip as they learned so much in so little time. They became more resourceful, confident, and independent. They learned how to do hard things and to see and process things they had never before considered. Constantly faced with unfamiliar situations they responded well. Ebey showed amazing care for her sisters by always watching out for them and being like a third parent. We actually left her in charge baby-sitting way more than we’ve ever done in the U.S. Emily, displayed her constant quick wit and humorous look at everything. Hinckley still bossed everyone around with her life and spunkiness. 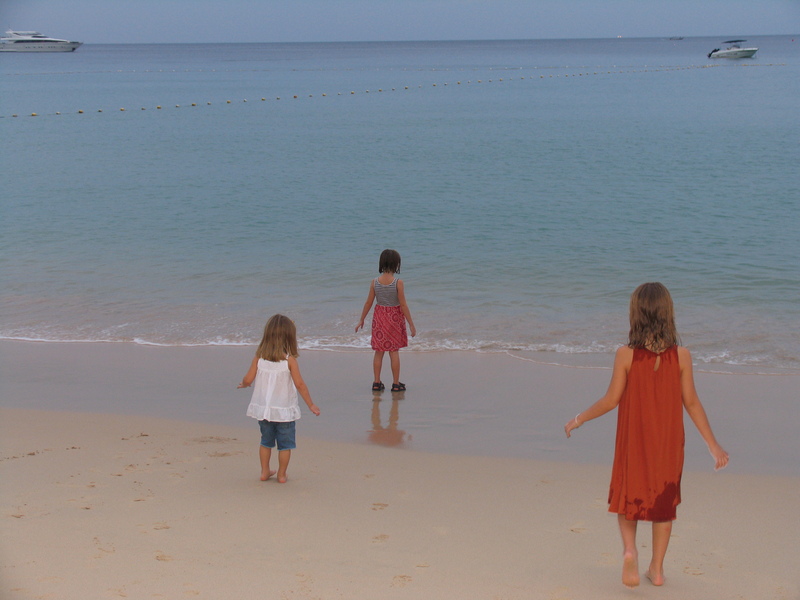 Spending two and half weeks straight as a family may be the very best part of the trip. I travel so much that spending a few days in a row together, especially without having to work the whole time, is rare. So to spend 17 straight days together was something that literally may never be duplicated. I felt like I came to know each of the girls in new ways and that my relationships were strengthened in many ways that I couldn’t have achieved at home. Just this focused time together was worth any amount spent on the trip. Chicken Pox: When we looked into vaccinations and health related issues of travel to Thailand the main thing of concern was chicken pox. There is little malaria, and it wasn’t really dengue season, so chicken pox and stomach issues were the only real concerns. We had Hinckley’s vaccination moved up a year or two so that she was covered. Sure enough, a few days into the trip, small red spots started showing up on Ebey’s face. She got chicken pox. Because she had been vaccinated they never broke out too much, but still, the several red spots stayed with her most of the trip and were something for constant monitoring. Neither of the other two got them. The adults had some minor stomach issues, but for the most part we all stayed in great health, even though we ate freely from the roadside. Hippo: Ebey has a little stuffed animal named “Hippo” that she has carried with her and slept with since she was an infant. Hinckley loves to take things and put them into drawers and cabinets and when we arrived in Phuket and realized Hippo didn’t make the trip we managed to get it out of Hinckley that she had taken Hippo out of the luggage and put him into “his home” in a cabinet in our room in Chiang Mai. This was a crisis. I emailed Joy’s House, they found it, and had it sent to our hotel in Bangkok. 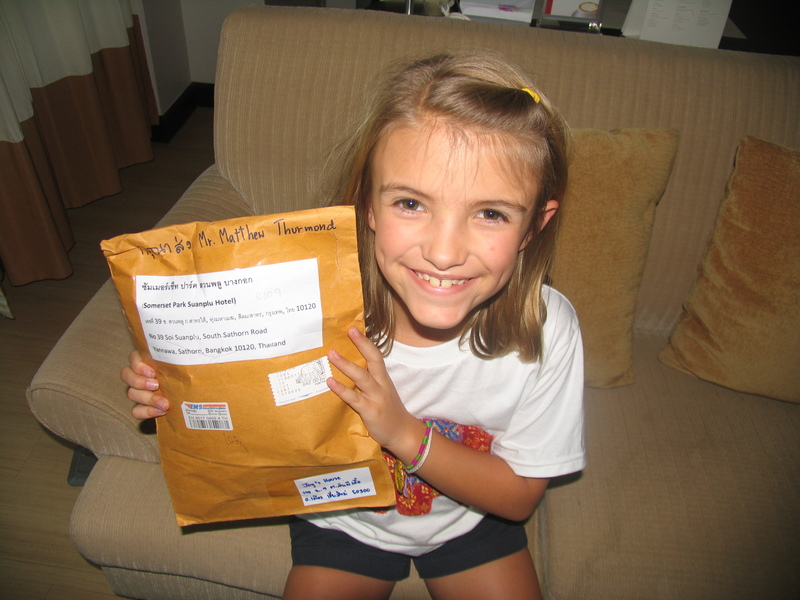 It arrived on the last day we were there and Ebey and all were so happy that Hippo’s journey ended back with the family. Transportation: I’ve often referred to this trip as an “adventure.” I strive to have a spirit of “adventure” in everything I do and I so desperately want my kids to have that too. I just think it is the best way to live. To me, “adventure” is characterized by uncertainty in the route, but confidence in the destination. It focuses on the “en route” and “in between” time of a journey. Adventure isn’t about where one ends up so much because that is usually implied (either tangibly or metaphorically), but the spirit with which one approaches getting there. It makes every journey fun to matter how long or windy the road. In this spirit of adventure I have to talk about our transportation. It was always so much more than a way to get from point A to B and became a huge storyline of the trip in and of itself. The girls kept a close count and took pride in on all the different modes of transportation we used. 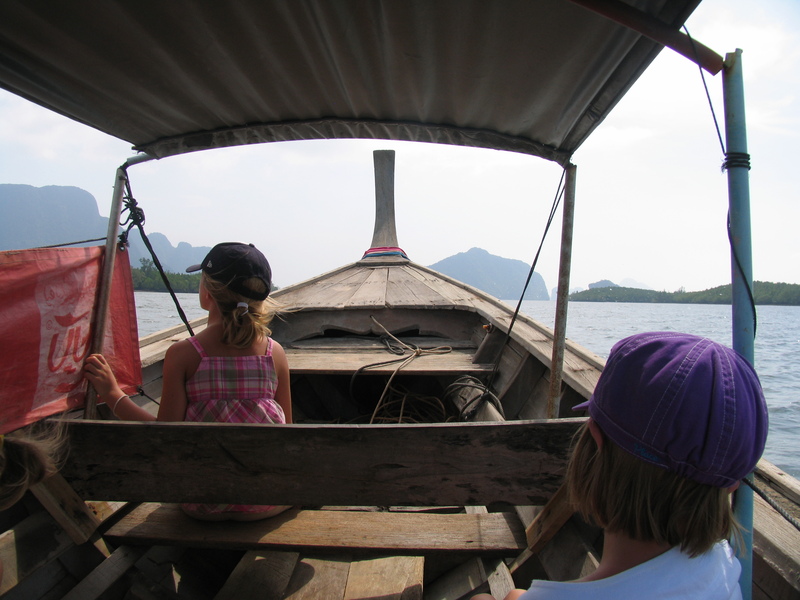 Here is the latest list: Plane, train, bus, subway, skytrain, taxi, songthau, rental car, tuk tuk, ferry, long-tail boat, canoe, bamboo raft, bicycle, elephant, and ox-cart. They tried to slip some others like waterslides, waves, feet, floaty thing, and escalator in there, but the legitimate list was at 16. The only one I missed was the ubiquitous Thai motorcycle, which really should have been experienced. Each of those modes of transportation had a life of its own. The elephant was by far the best, but the tuk tuk, often discouraged as potentially unsafe in travel books, was our second choice for sure. It always felt so good to have five of us crammed into a little tuk tuk weaving in and out of traffic around Chaing Mai and Bangkok. There was no better place to feel a part of it all and to soak up the sights, sounds, smells, and feels of Thailand than in the back of those tuk tuks. What’s Next? 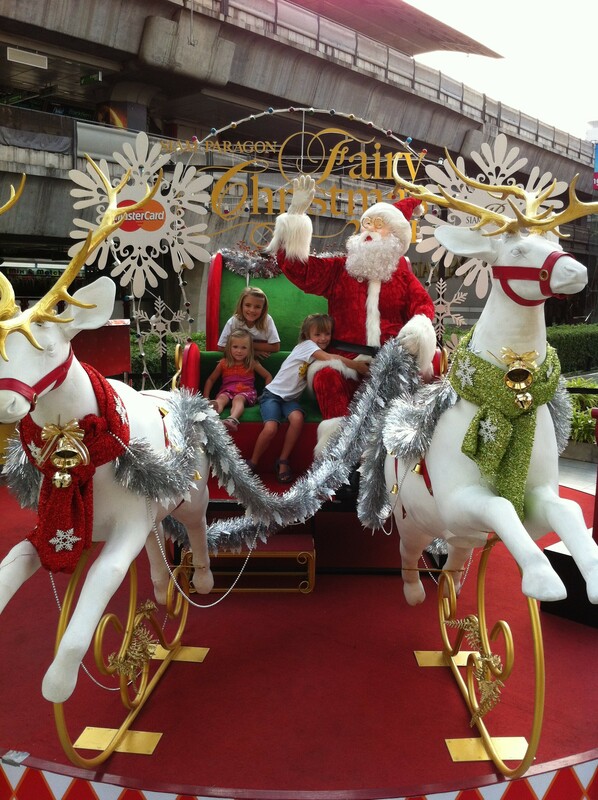 : I’m glad we come back to Christmas fun, because the let-down from the trip being over is immense. For more than a year I’ve thought about and prepared for this trip. Rarely a day has gone by that I didn’t read something, prepare something, or talk with the family about something related to this trip. 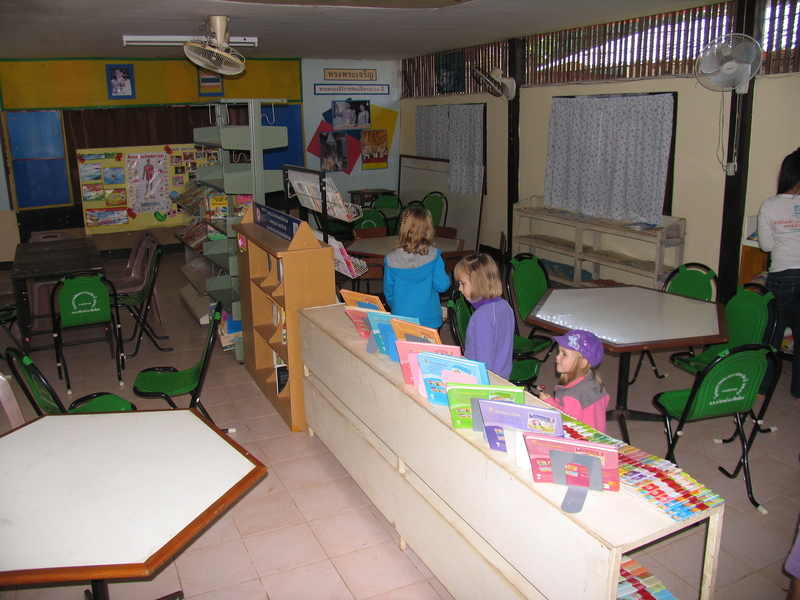 It was a project that brought us together over a long period of time before we ever left for the airport and provided so many unique learning and teaching opportunities. I’m not ready to plan another because I think anything I could imagine would pale in comparison to this trip. 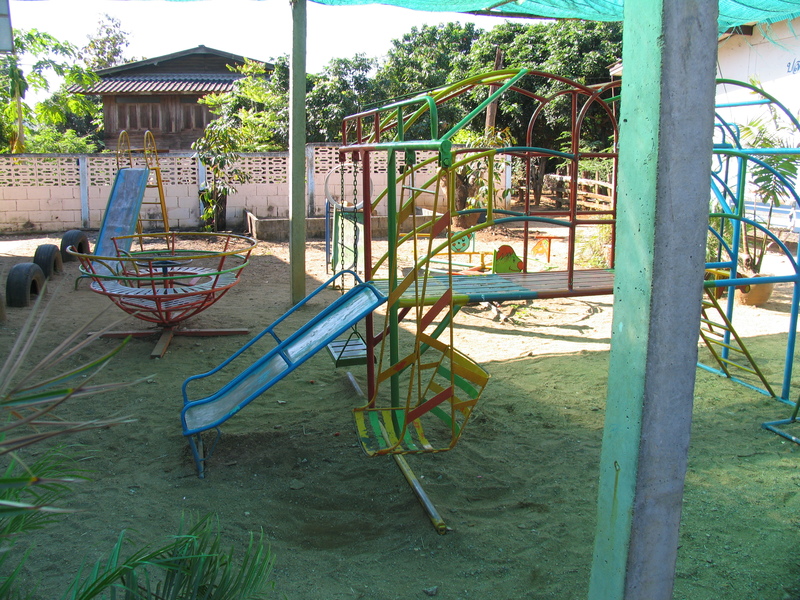 It had a great mix of exotic, far away, urban, rural, beach, local friends, perfect right ages for the kids, weather, long duration, affordability, safety, etc. I honestly don’t know how we can match it. Still, I want to try, but not quite yet. We want to find a way to somehow come up with the money to do something like this every three years. It is just so worth it. 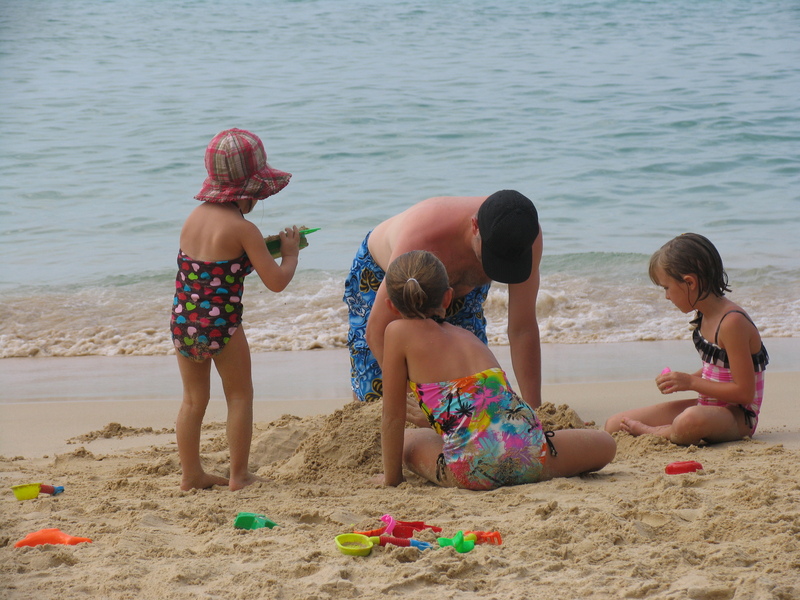 I hope other families will step outside of the easy and familiar vacation and do the same. It will be worth it for all. In planning for the trip I was worried about the final two days. I had planned for us to spend them in Bangkok making final purchases, getting final fittings, and wrapping up any loose ends before we went home. I was worried they would be anti-climactic and that we would wish he had just gone home. It turns out my worries were unfounded as the last two days became a couple of our best and when it came time to make that trip to the airport none of us were happy about it. We wanted more time. The last two days weren’t great because of new adventures, but because of familiar ones. It felt great to be in a place so foreign yet familiar. 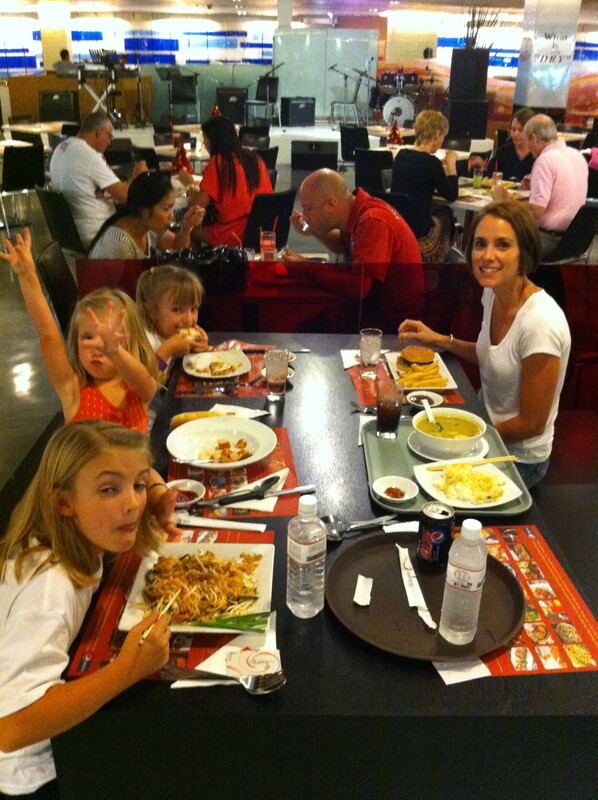 We mostly just jumped around in Bangkok and shopped. 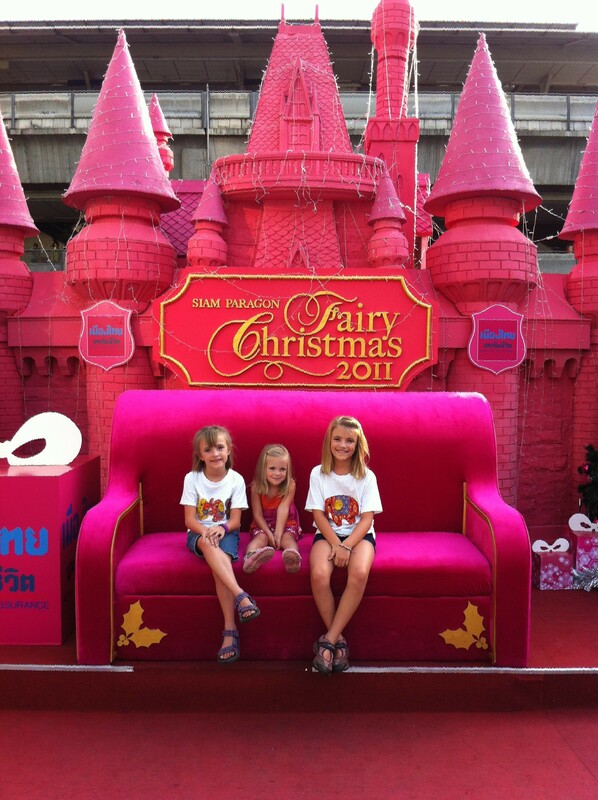 We had our custom clothes tweaked in Sukhumwit, shopped many hours and the dizzying MBK Shopping Center, searched around in Siam Square for a good place to get a pedicure for the girls, enjoyed the lights at Siam Center, and had a great search for the greatest dessert at Siam Paragon. We had our final tuk tuk, SkyTrain, and taxi rides. Shopping can be vilified as a product of American excess and consumerism. 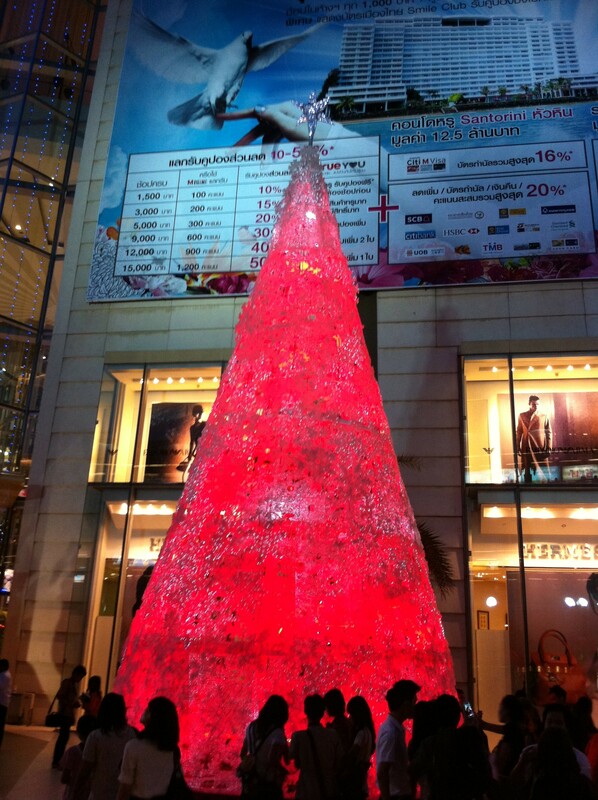 Well, in Bangkok, where Americans are a small percentage, the shopping fervor is alive and well. Shopping in Bangkok isn’t an “American” thing to do, but a Thai thing. They do it well. Mall after mall line the Siam area in Central Bangkok. All have ramps that spill directly into and off of the SkyTrain. The Malls have all different feels, price ranges, and types of products. Just outside each of them are crowded streets with vendors selling all types of foods and crafts. At any moment you can reach out your hand and purchase something. Inside the malls is the same feel as the sidewalks outside. They are like casinos where you get lost and turned around and have a hard time finding an exit. The malls in this area are all 6+ stories high with multiple escalators. They are all full of shoppers. 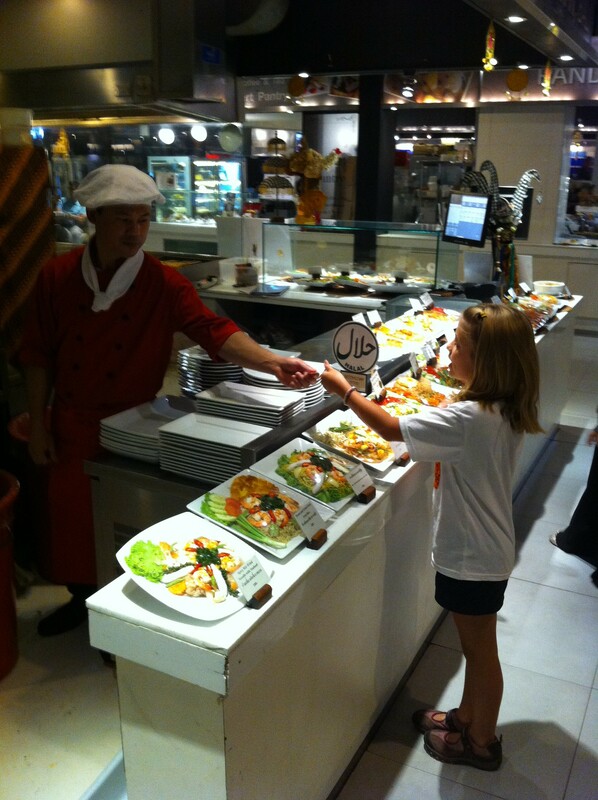 We enjoyed the amazing food courts with the card coupon payment system and the wide variety of international food cooked on the spot. 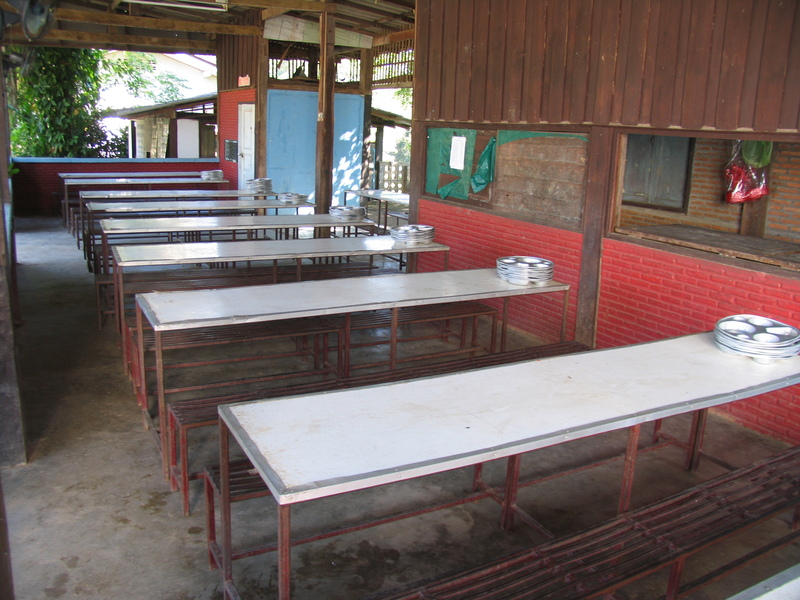 These are gourmet food courts. We could (and did) sit at a table with a mix of Vietnamese, Thai, Mexican, and American food all freshly prepared by a team of chefs—all at a great price. I particularly enjoyed watching Emily haggle via calculator (this is how prices are discussed when shopping) over the skirt she was buying for her mom for Christmas. The vendor had started at 850 Baht and made a final offer of 600 Baht. Emily really wanted to get this skirt for Kathryn, but when I explained to her that 600 Baht was about $20 she shook her head and started to go. The vendor then asked Emily what she wanted to pay and passed the calculator to her to type in her desired amount. After a moment of confusion Emily slowly punched in “400.” The vendor was incredulous and offered 550. Emily started to walk away again when the vendor finally said “500.” Emily took the offer this time. She did far better bargaining than her dad would have done. It was a proud moment for me. Few things stand out from the last few days, but we had a wonderful time enjoying being a part of the great energy and life that is Bangkok. It was hard to leave and we can’t wait to return. After a few days of feeling stranded because of my insistence on snubbing the Phuket taxi mafia, I finally walked down the street to a place that said “car rental.” I had avoided this because I assumed driving in Thailand was too chaotic and that renting a car would be too complicated. Wrong! Easiest car rental I’ve every made. Show them you have a pulse, give them a little cash, and for $45 you have a “fully insured” car rental that can seat seven. Why didn’t I do this earlier? The night we first got the rental we drove out (on the opposite side of the road and car) and went to store to buy some glasses frames for Kathryn and the kids. Kathryn assured me that the frames we got her would cost 2.5 times the price we paid in Thailand. In the 70s James Bond had a movie called The Man with the Golden Gun. 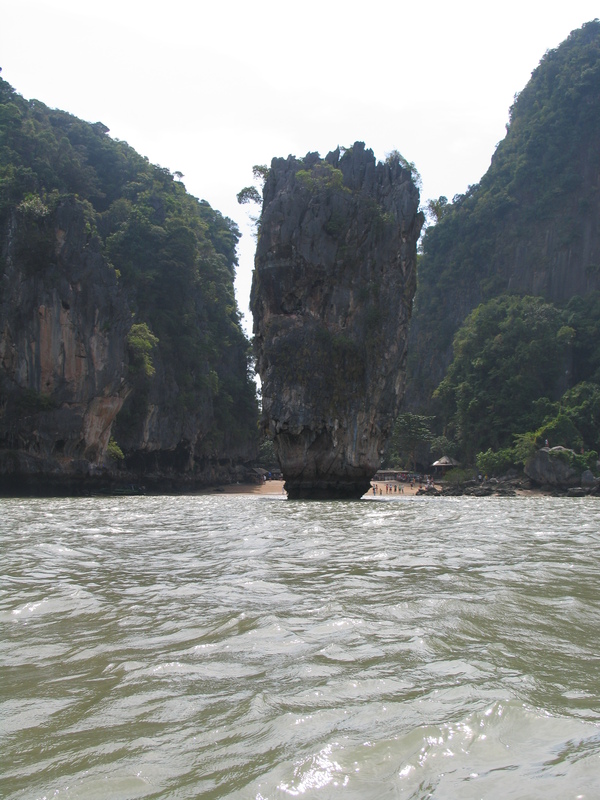 Now I’ve never seen this, but apparently it made Phang Nga Bay internationally known. 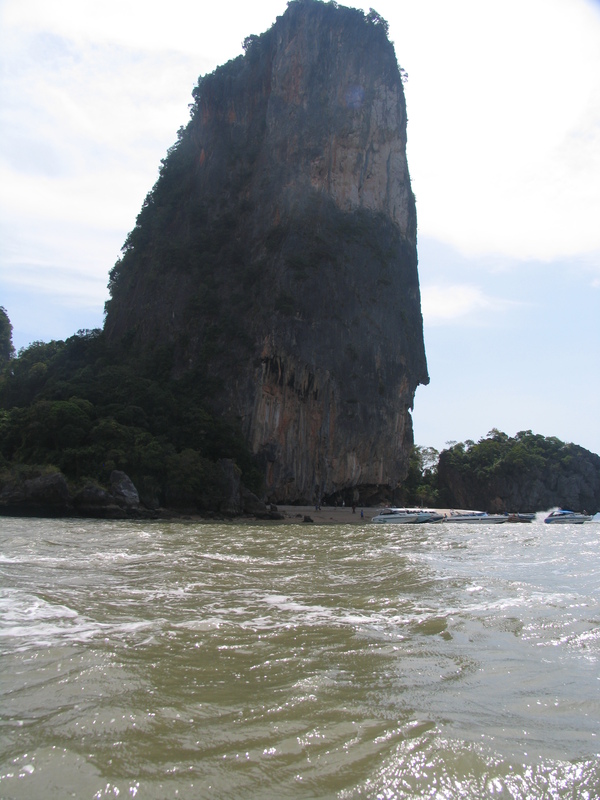 To see some awesome pictures of it just look up “Phang Nga Bay” in Google Images. 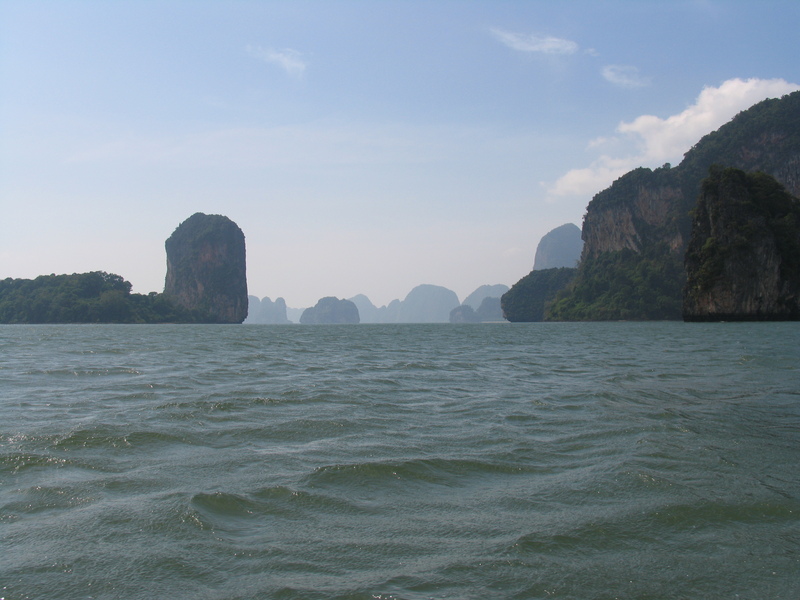 I had seen the pictures and read the reviews of people’s trips to Phang Nga Bay, but didn’t really want to pay the prices asked by the speedboats pushed by all the resorts. So with the car rental we decided to try to make it happen on our own. 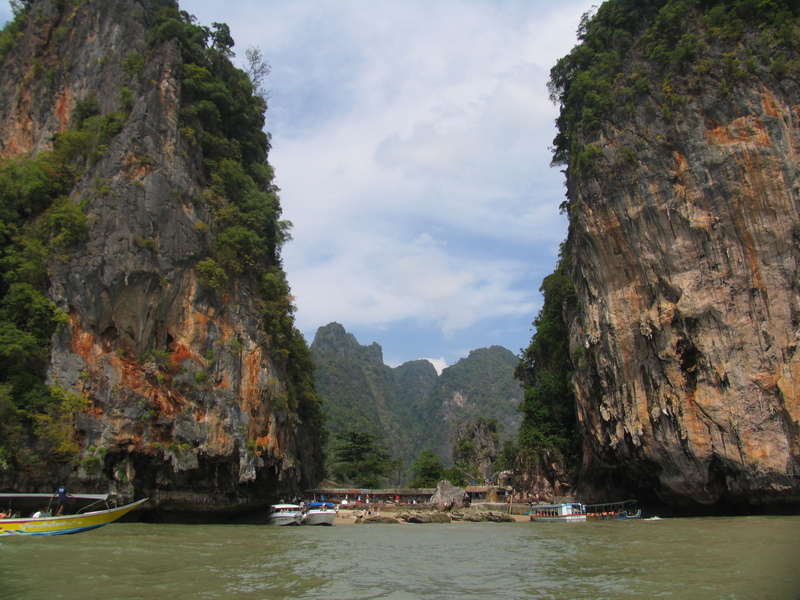 We drove North from Phuket, leaving the island for the Thailand mainland. 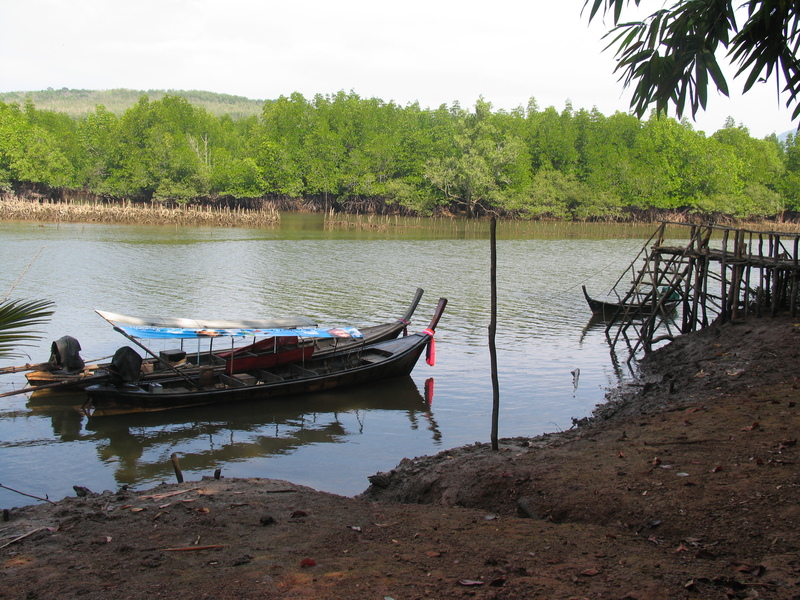 About 45 minutes from our hotel and some 15 minutes from Phang Nga town itself, we saw a little homemade sign that said “Phang Nga Bay” with an arrow. We followed the arrow down a little residential road and through rubber plantations. The road turned off to the right (another small sign) and turned to a rutted dirt road. Finally we saw water and a “pier” with a couple of small long-tail boats. We were the only people or cars around until our future captain, Bao, turned up on his motorcycle. He offered to take us out to the island for the day. We negotiated a price that was about one-third what one of us would have cost on the luxury speed boats and were on our way. See the “pier” and boat we left from below. We realized once we were out there that we had no life jackets and our boat was by far the smallest and oldest of any of the boats carrying tourists out there. We were sure, however, that we were having the best experience. 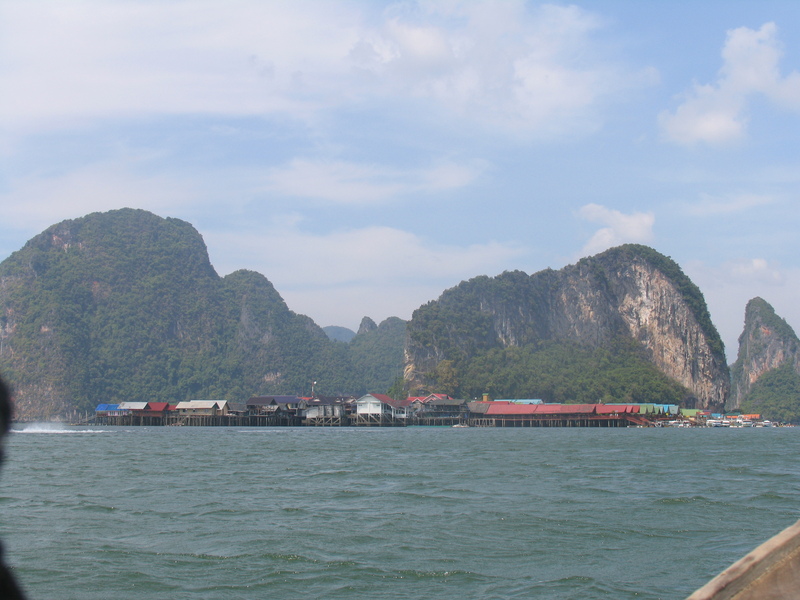 We cruised around Phang Nga Bay for about five hours, visiting James Bond Island, some caves, and having lunch and at Koh Panyee, a sea-gypsy village built on stilts. 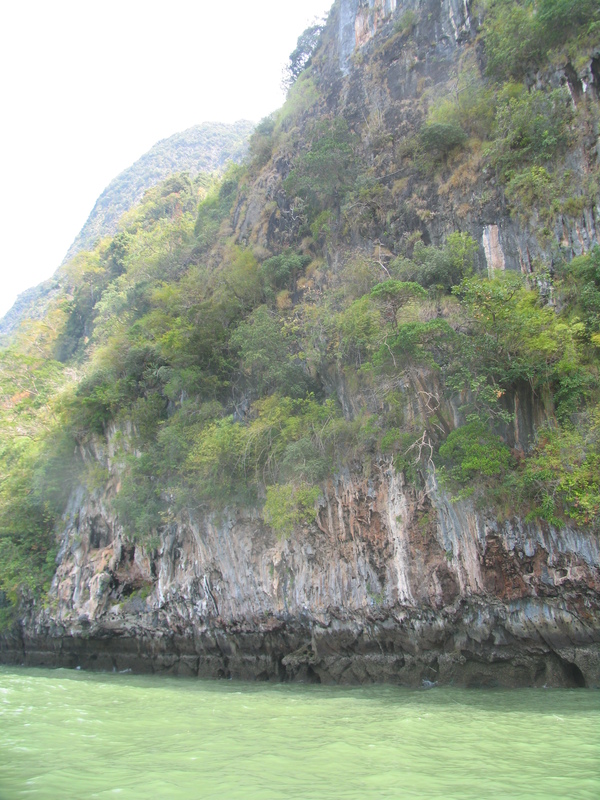 Our boat was a little slow and small, but Bao was a great captain and the vertical limestone cliffs and islands were other-worldly. It was like the movie Avatar was brought to life right before us. It was another reminder for us that usually the best parts of trips are the adventures when you don’t have a plan and know how it is all going to work out so you just step out go for it. 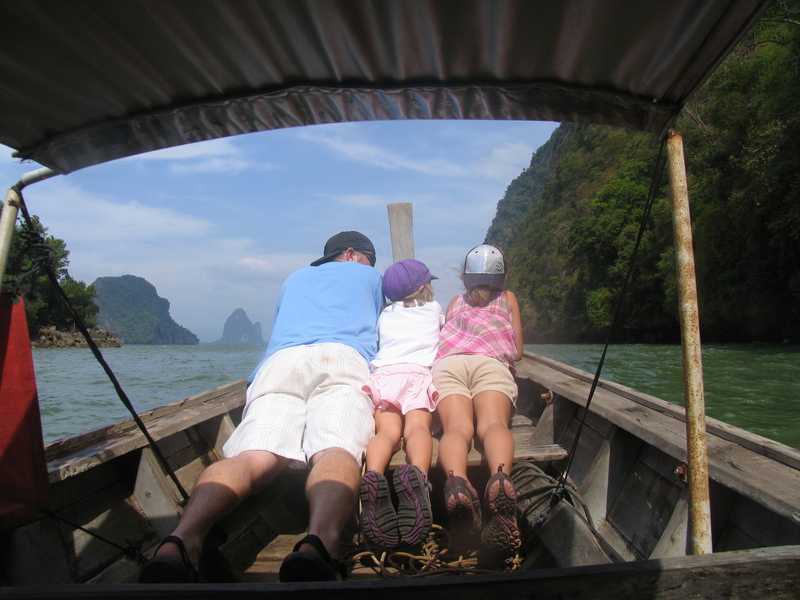 Our day in Phang Nga Bay is one we won’t ever forget. 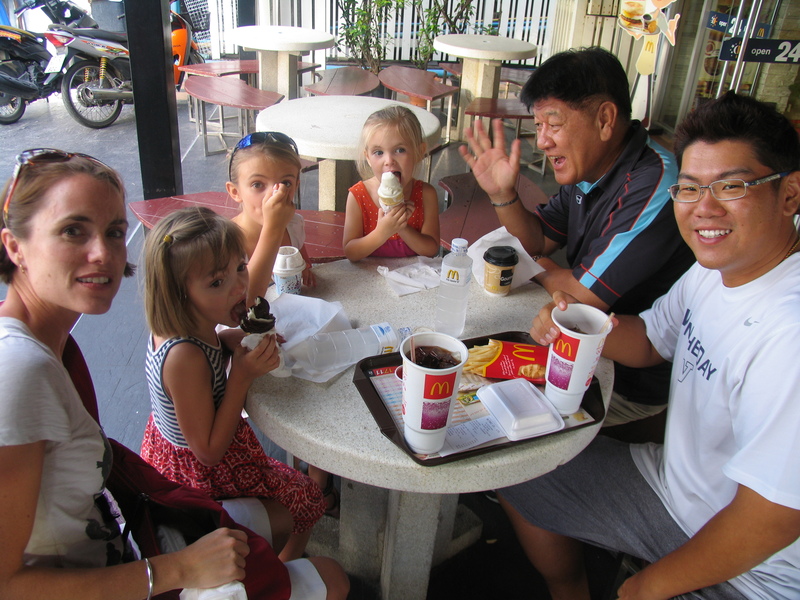 To celebrate our authentic Thai adventure we stopped at McDonalds on the way home. 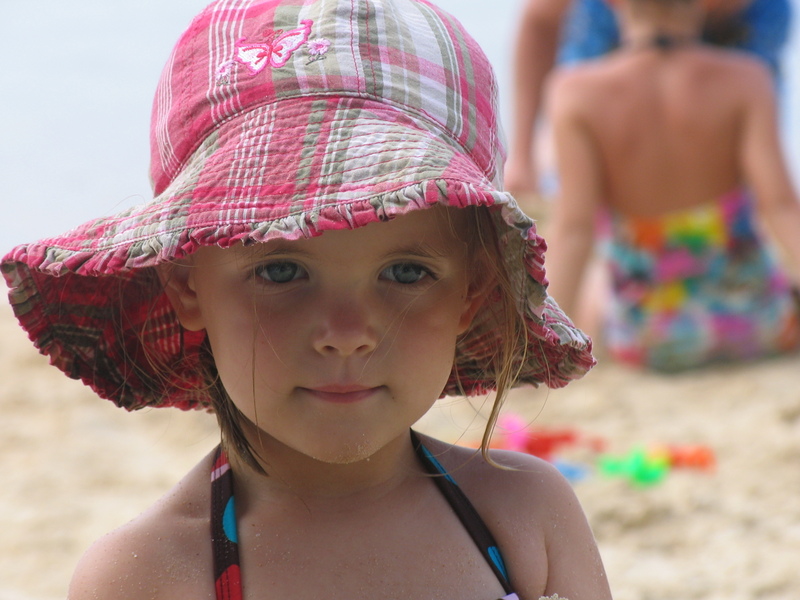 Two days of beach and pool time doesn’t give a whole lot to blog about. So I thought we’d take a break from the daily activity log for a little geography lesson. What better way to do it than through swimwear? Russia: A massive country that dominates the northern half of Asia, stretching all the way from Europe to the Pacific. With a diversity of ethnic groups possessing diverging interests stretched over a vast swathe of oft-frozen tundra, Russia needs to dedicate most its efforts to security and keeping the union together. This is no small task. Food scarcity, underdeveloped transportation, and sparse population add to the Russian challenge and keep them focused constantly on controlling and securing the peace through heavy-handedness and force. Geographic realities guarantee this in perpetuity if they are to stay as one large country. Because of all this focus on security, Russians have obviously completely neglected teaching proper swimwear etiquette. How else can you explain these three looks? In the first you will see the classic Russian male’s swimwear. This neon orange piece with an inexplicable “A” on it is neither Speedo nor shorts. In North America we call these “compression shorts” and wear them under our shorts for workouts. Although this suite comes in many different colors, all Russian men seem to prefer it. I know the thong could be found on all continents, but in this case we have Moscow’s finest. Please, can someone help her out? There are some things that shouldn’t be flaunted. Lastly, you have some Russian “bobushki” here. I dare anyone to tell these Russian grandmothers that they aren’t wearing these bikinis well. Exactly, and that’s why they’re roaming the beaches of Phuket in droves—no one has the guts to correct them. North America: From age 24-55 the American male does basically nothing but work and family. Work, work, work, leaves very little time for staying in tip-top shape. 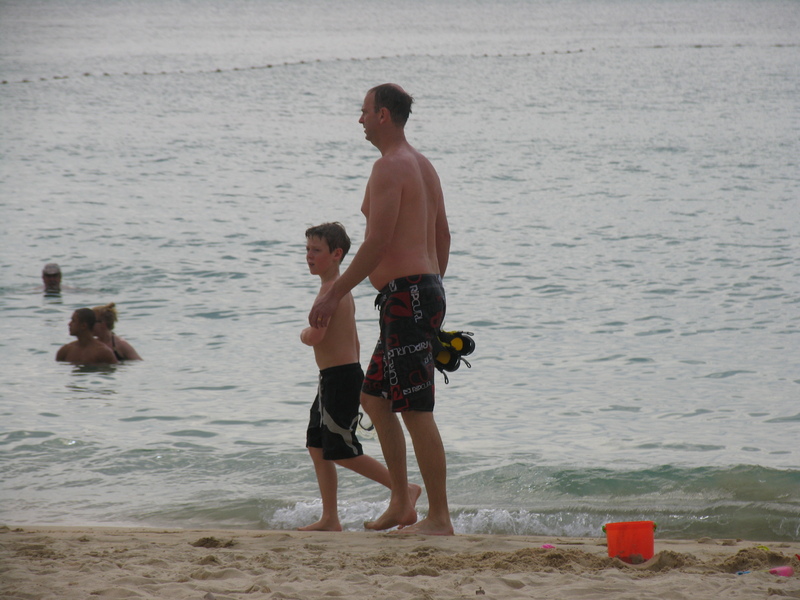 Every hard-working and dedicated family man in America has a medium-sized belly (be skeptical of those who don’t because they either aren’t working hard enough or aren’t spending enough time with their family). But still, even the 45 year-old has to have the same shorts that the world’s top surfers wear. When you work as hard as these guys do you earn the right to wear the same shorts as surfers. Notice the father wearing the same style and his son, as if he is just as cool and current. Also, notice the classic American middle-aged belly–neither in shape or obese. He always feels just a few months of hard work from being in shape. At 65 he’ll now be a couple years of hard work from being in shape and he’ll be wearing a floral print shirt,spending his days on cruise ships feeling like he’s a world traveler when he ventures off that ship for a couple hours at a time. Note: It is slightly possible that this man is a European educated in North America. Europe: Europe has had some stretches of history when it was the center of the universe (actually not as many as our history books tell us). The latest was from the 1600s to WWII. Since then, however, Europe has been slipping from power and relevance on the world stage. It is well stated that Britain’s “finest hour” came in the 1940s. It’s been downhill since. The European continent’s latest experiment, the EU, is a now a complete disaster economically and politically with the worst yet to come. Europe is now the 3rd or 4th most important region of the world. This is a tough pill for the European psyche to swallow. To cope with what could be referred to as a sort of geopolitical “little-man syndrome,” they do things to show bravado and make their presence felt, their past and bravado may be all they have left to cling to as the world passes them by. One way they have made themselves a factor is through the prolific use of the Speedo-style swimsuit. You have the traditional and the French cut (not pictured) versions. Both say loud and clear, “you better take me seriously.” Is there anyone who doesn’t take this European seriously? Still, you have to see that this is compensating for something. I don’t have a picture. Who could have the composure in such a moment to reach for the camera? I also don’t know what this says about India, a rapidly developing country with a booming economy and still has what the rest of the world would call a major poverty problem. India is bordered on the north by the world’s largest mountains and a vast Indian Ocean borders the rest of the country shaped like an triangle with the point on the bottom. The mountains and ocean make India a virtual island, geographically speaking. 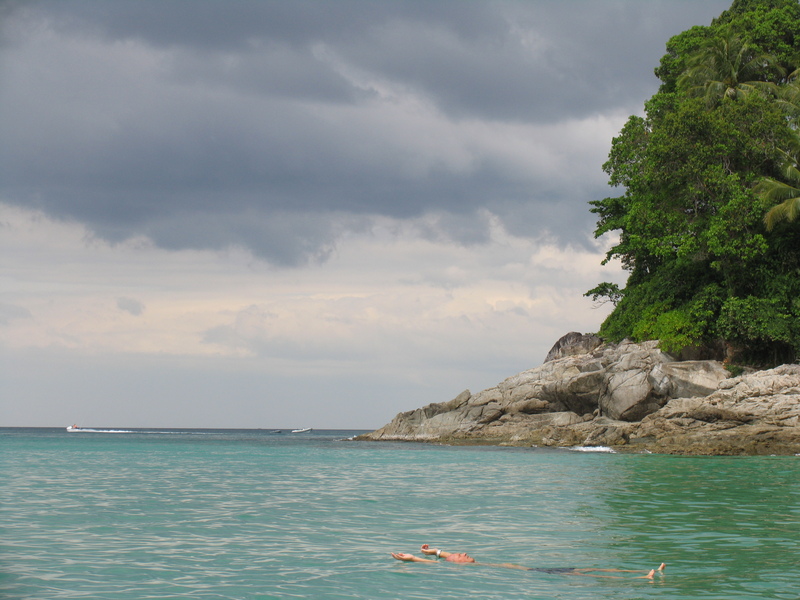 Perhaps this isolation from the rest of the world has caused them to develop a completely different set of norms that make wearing wet tighty-whities down the most crowded beach in Phuket perfectly normal. Then again, with more than a billion people of mostly the same ethnicity and religion, maybe these two characters are trying to do something to stand out. Maybe its just good karma. This ends today’s geography lesson. 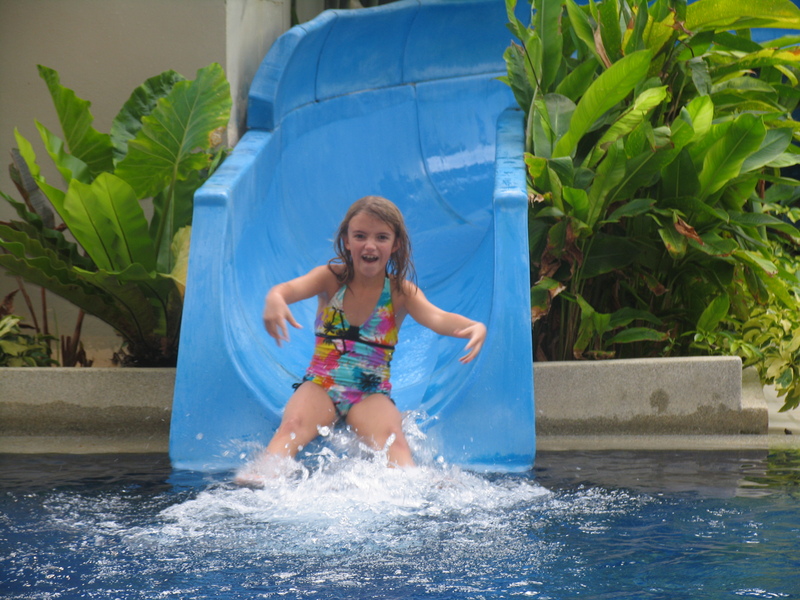 We spent a couple of days mostly at the pool and Surin Beach or somewhere in between. 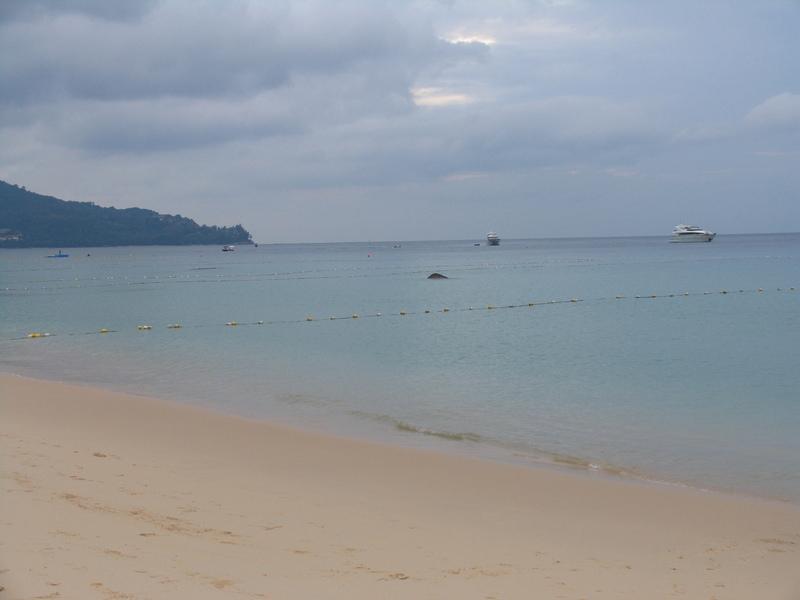 Surin is a gorgeous beach with clean turquoise water that is warmer than anything I’ve swam in before. 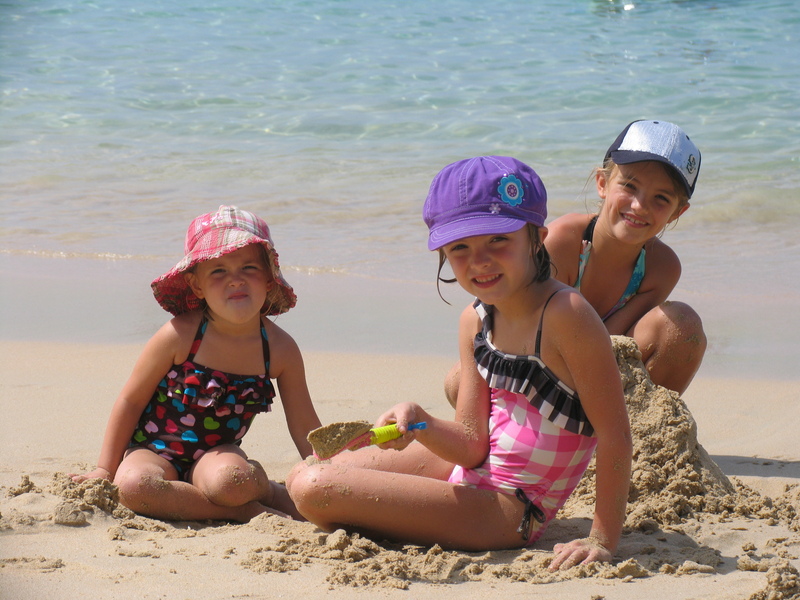 We swam, searched for crabs at the end of the beach, built sand castles, etc. 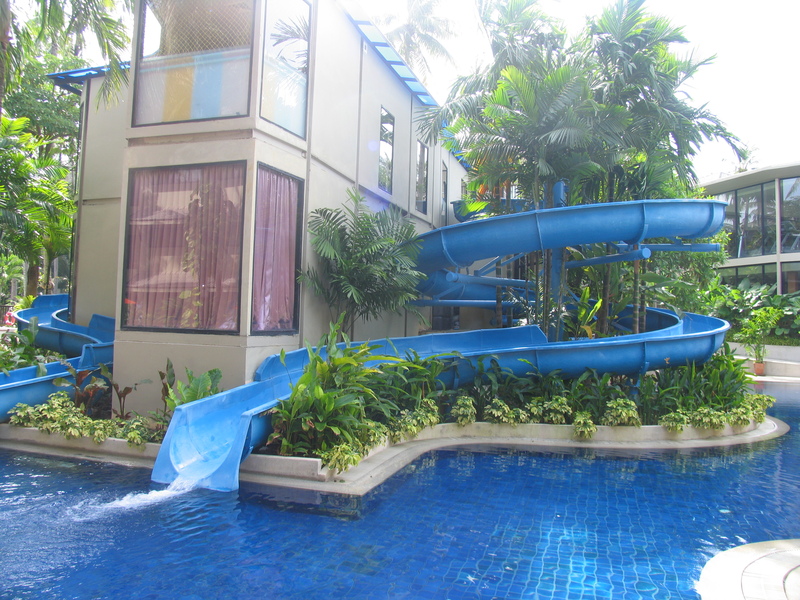 The hotel pool has a couple of great waterslides for the enjoyment of big kids and immature adults, like myself. Apparently, there is a travel agent in Moscow that made a deal with Courtyard Marriott Phuket at Surin Beach because I think they’ve sent every one of their clients to this hotel. 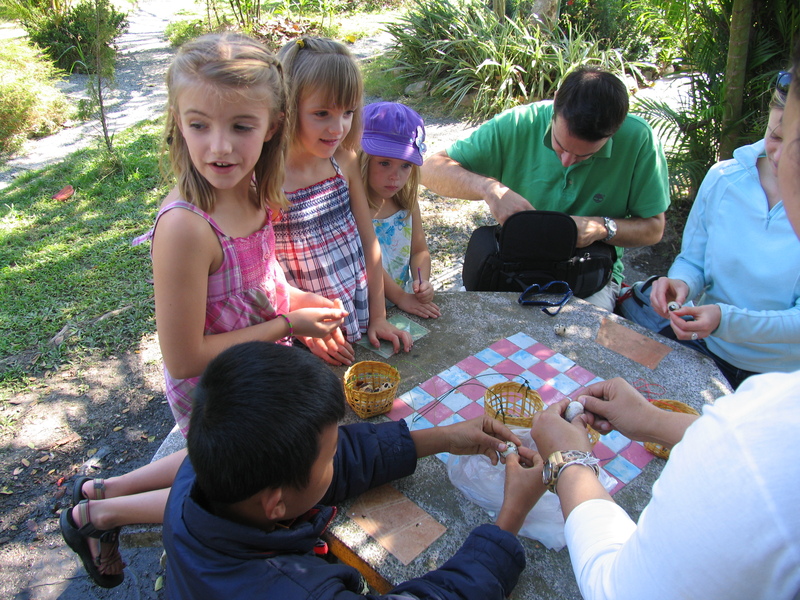 Kathryn has been able to practice her latent Russian language skills. Because I made fun of some other cultures enough above, I’ll stop for now, but I could add plenty about the Russians. They are definitely hard to recognize. 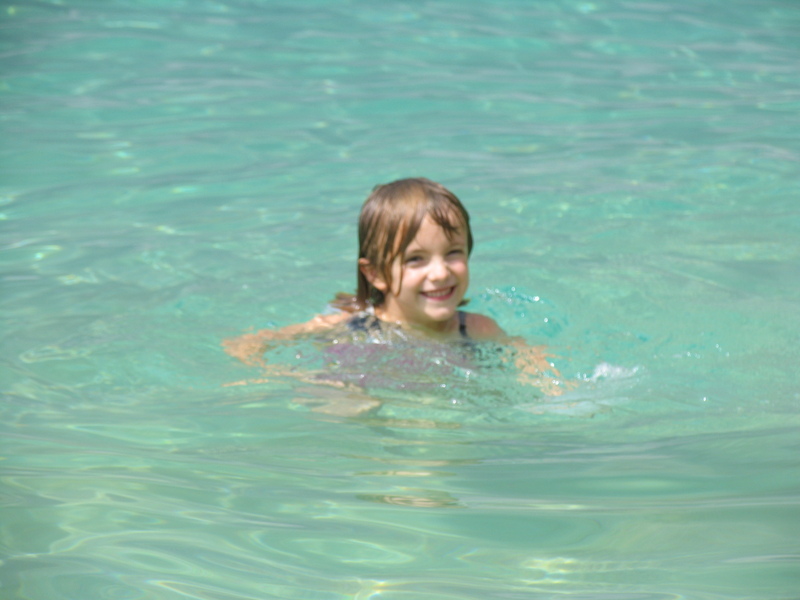 I’m proud to say that after a couple days at the resort and beach the kids are anxious “for another adventure.” We thought they would love to just do the pool and beach, but it appears that our travel style is now our kids’ travel style as well. Tomorrow we’ll go on another adventure. 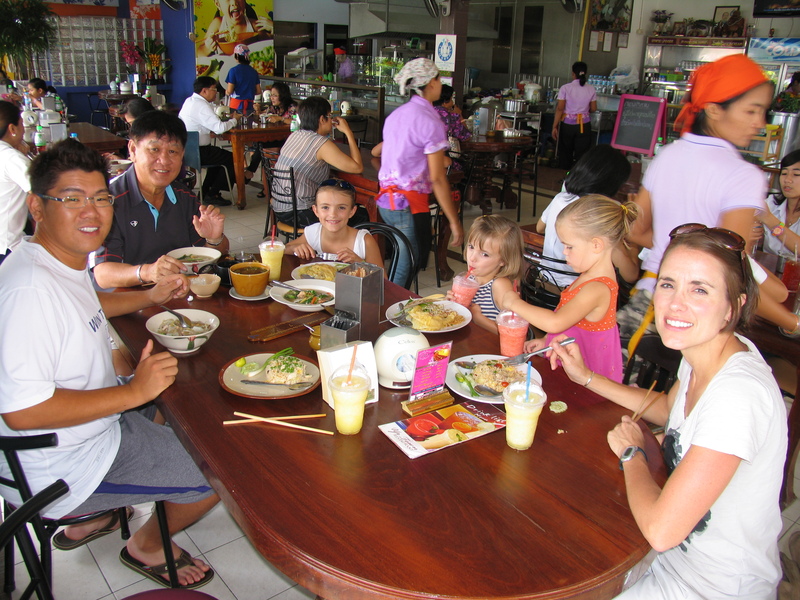 Our friends from Singapore (KC and Tze Huang Choo) flew up to meet us in Phuket today. 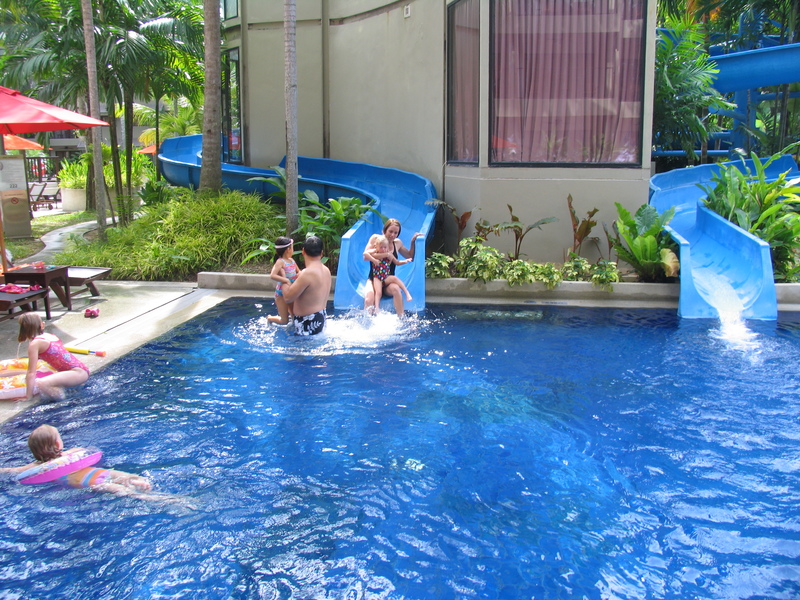 We spent some time at the pool and the beach then took advantage of their car to go to Phuket City, an inland mess of close to 100,000 people with no road signs and landmarks anywhere–easy to drive around in circles all day. Lunch was awesome and afterward all seven of us went for a classic one hour Thai foot massage hosted by Mr. Choo. This was quite an experience. Hinckley was so funny cracking jokes and staying wide awake while the rest of us slept most of the time. At lunch, Kathryn accidentally ate a tiny pepper from her Tom Yum Gauw Soup that immediately sent her into a panic. She has a lot of composure and toughness, so when I saw her slightly panicked I knew she really was in trouble. Fortunately, she felt it immediately and didn’t swallow it, but her lips were numb and puffy for a good hour afterward. KC and I have become great travel partners. We’ve now done Bangkok, Chiang Rai (further north than Chiang Mai), Phuket, Singapore, and Malaysia together). His son Choo and I can add Japan to that list. Whenever I step foot in Asia they show their Chinese hospitality (something we Westerners can’t relate to) to make sure everything is perfect for the trip. They’ve really been great friends. 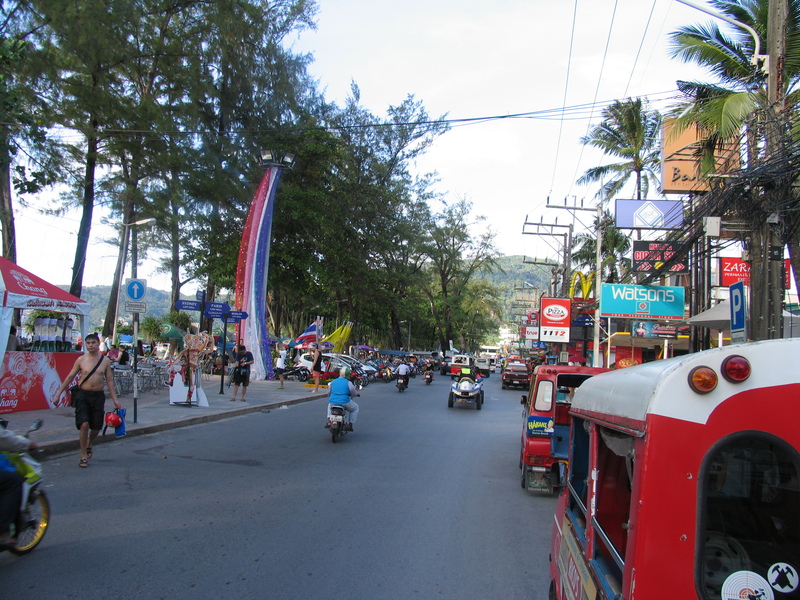 On the meandering drive from Phuket City to the famed Patong Beach Hinckley had to go the bathroom—and quick. KC pulled over to a roadside house and made Choo get out with Kathryn and Hinckley to ask to use the bathroom. KC simply said, “Thai people are usually very nice.” Of course, they obliged and Kathryn and Hinckley took off their shoes and entered the Thai home for Hinckley’s first experience in the traditional Eastern-style toilet—if you can call it that. KC laughed on their return and said, “What a great experience”–he wasn’t the three-year-old squatting in a Thai stranger’s house trying to pee into a whole in the ground. 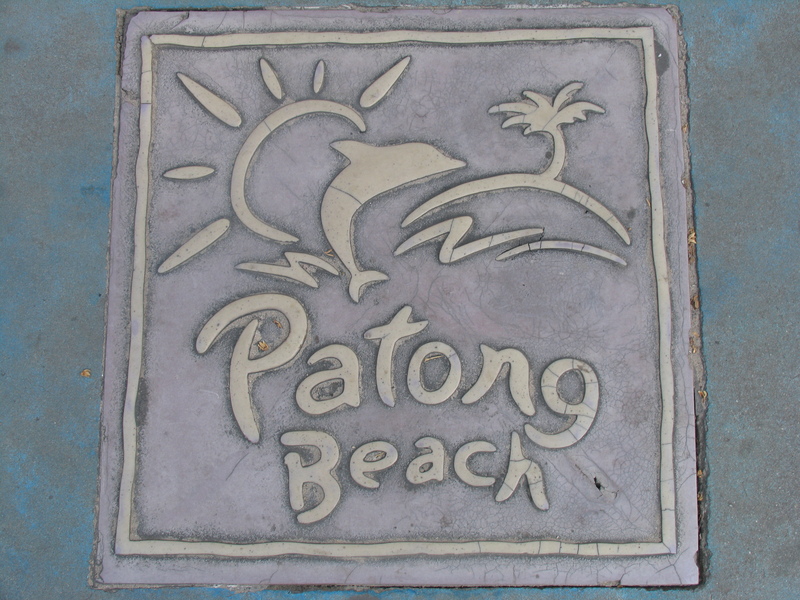 Patong Beach is pure madness with probably thousands of vendors along a long stretch of gorgeous beach. The whole town is alive, and it apparently gets crazy at night. 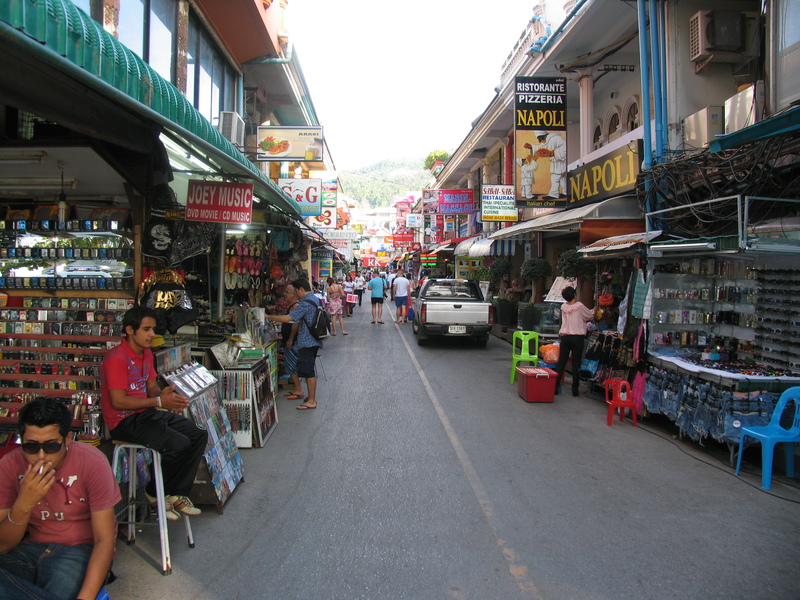 This is where partiers come for a good time in Phuket–not the ideal place for a young family, but fun to walk through and feel the energy for an hour or two. We had a drink at McDonalds and grabbed a rack of ribs on the beach from a vendor. 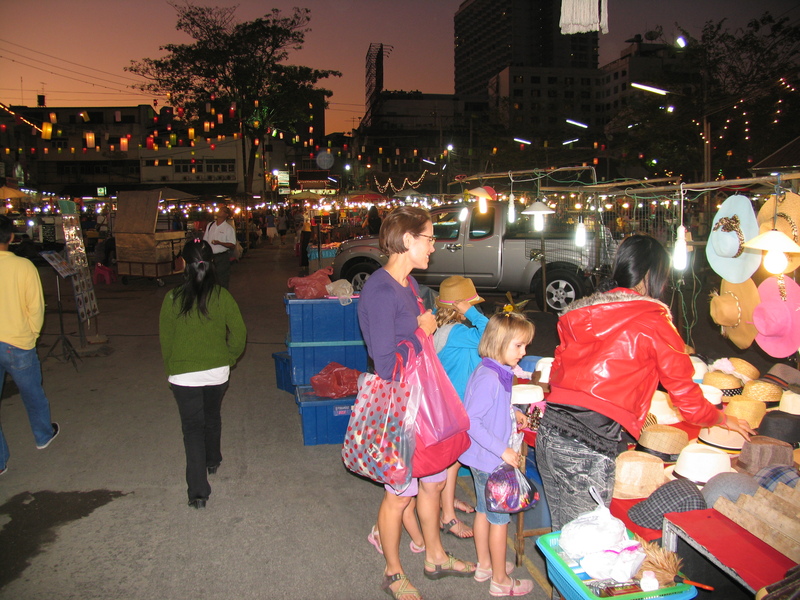 We looked into prices for a few crafts and felt even better about the negotiating we did up in Chiang Mai. One item we bought in Chiang Mai for 550 Baht was offered to us for 1800 Baht here. We had a few hours for some bike rides in Chiang Mai before flying to Phuket. Our flight was on Air Asia, Asia’s top discount airline. It’s a great Malaysia-based airline that flies all over Asia at highly discounted prices. Once you get to Asia, air travel is quite cheap. I had heard a lot of about Air Asia, but now that I’ve used it I’m more inclined to bounce around a bit more on future Asia trips. A two hour flight from Chiang Mai (so glad I don’t have to get back on that train) to Phuket took us to the beach for the first time. 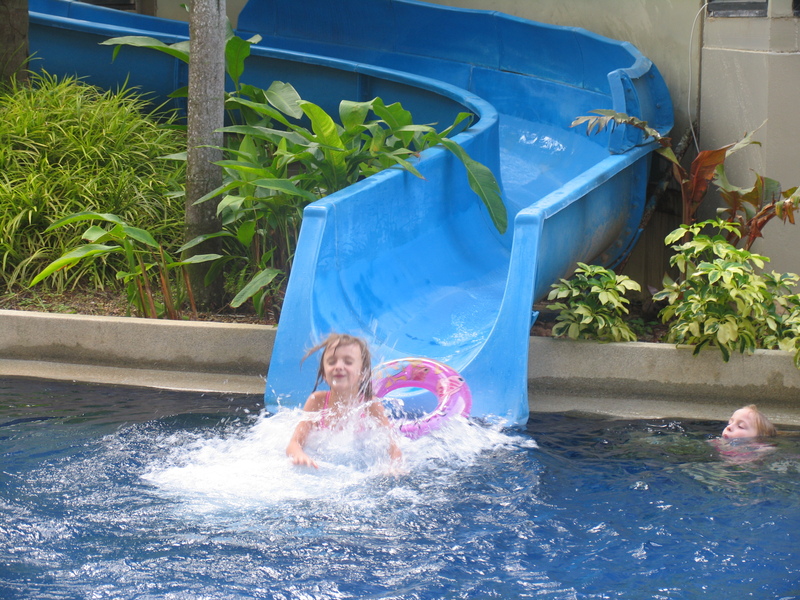 We first made a much-anticipated visit to the pool with the accompanying waterslides (pictures later of this). It didn’t disappoint. 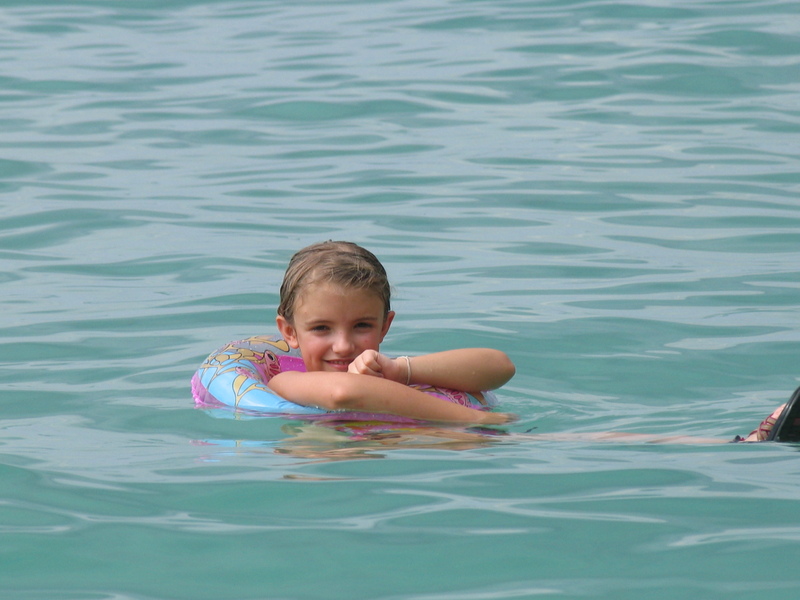 Then we made our way to the beach to take each of our first steps into the Indian Ocean and the Andaman Sea. Surin Beach is gorgeous and the water is warm. 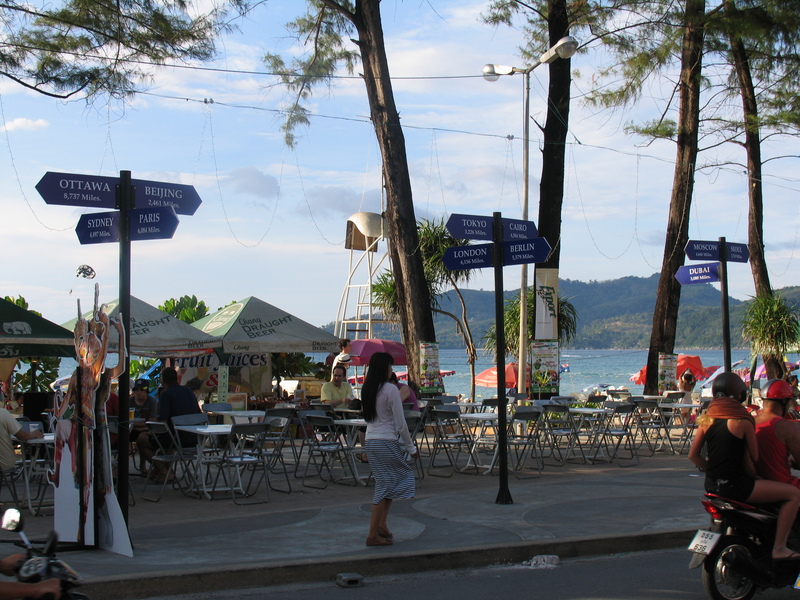 Instead of leaving the beach for food, the restaurants come to you as the back of the beach is lined with restaurants, beach clubs, massage parlors, tailors, and other vendors from one end to the other. We ate at the dirtiest Thai food place we found on the beach, which turned out to be a mistake as we were all a bit sick that night. Maybe we’ll go upscale tomorrow. 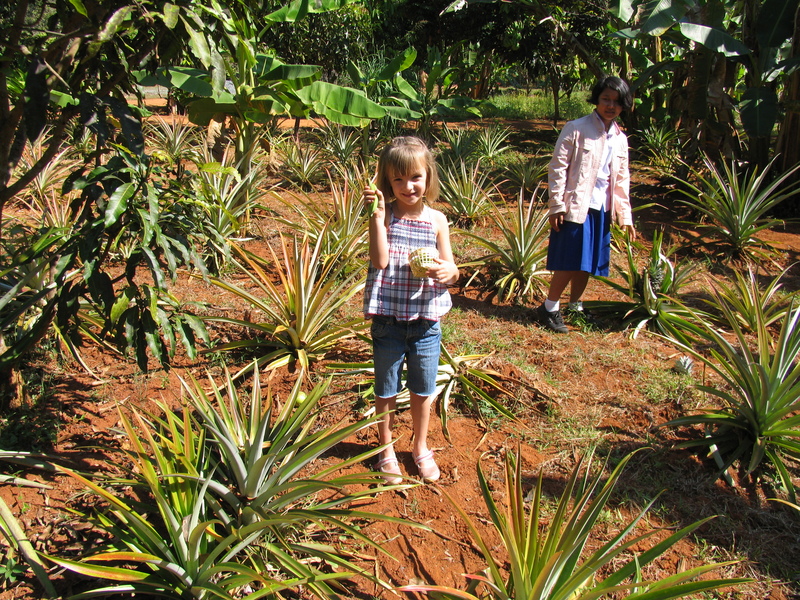 On our final day in Chiang Mai we decided to visit the farm that houses about 30 of the kids from Joy’s House. 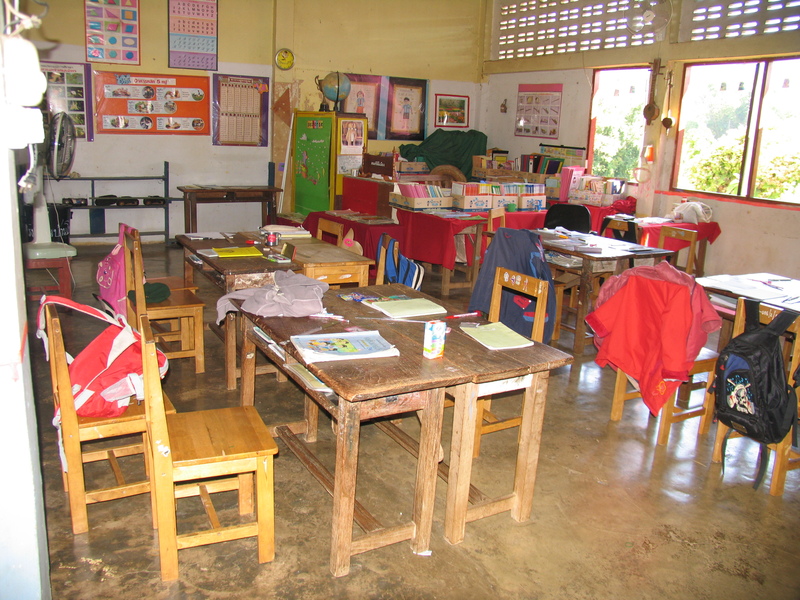 As part of the trip we were able to visit an elementary school in the farm’s local village. 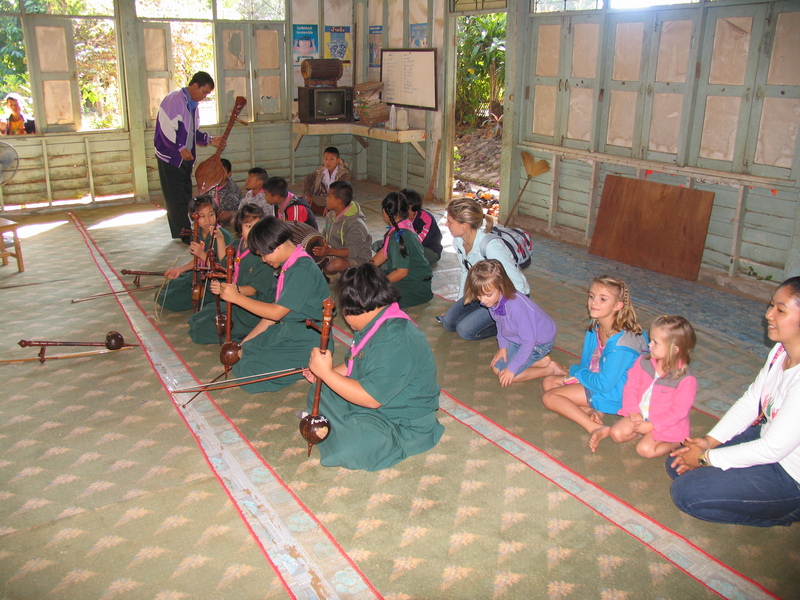 The girls met kids their age at school and the music class played some impressive music for us– a great experience for our kids at this school. 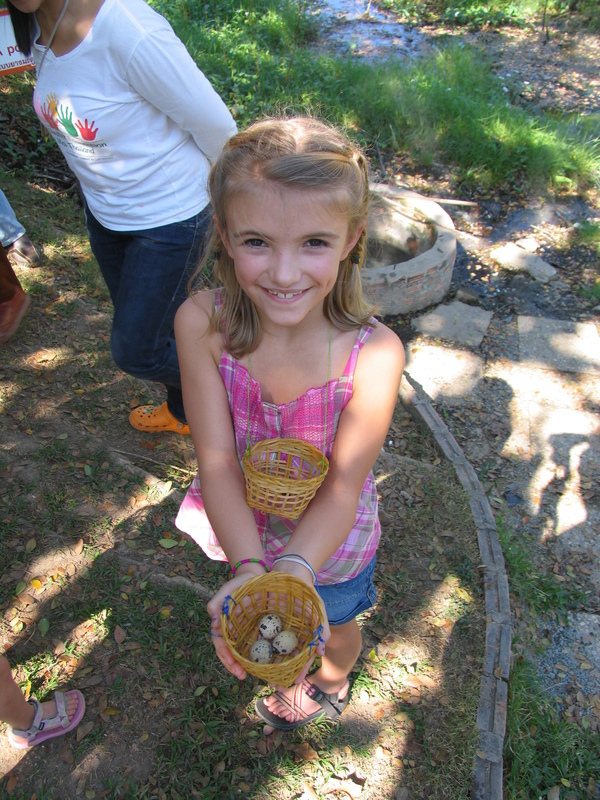 Then we boiled some eggs (not sure which bird laid them) in a natural hot springs—that was interesting. Add eating random eggs to the sulfur smell of the hot springs and you have a nice combo. In fact, the eggs were very tasty. 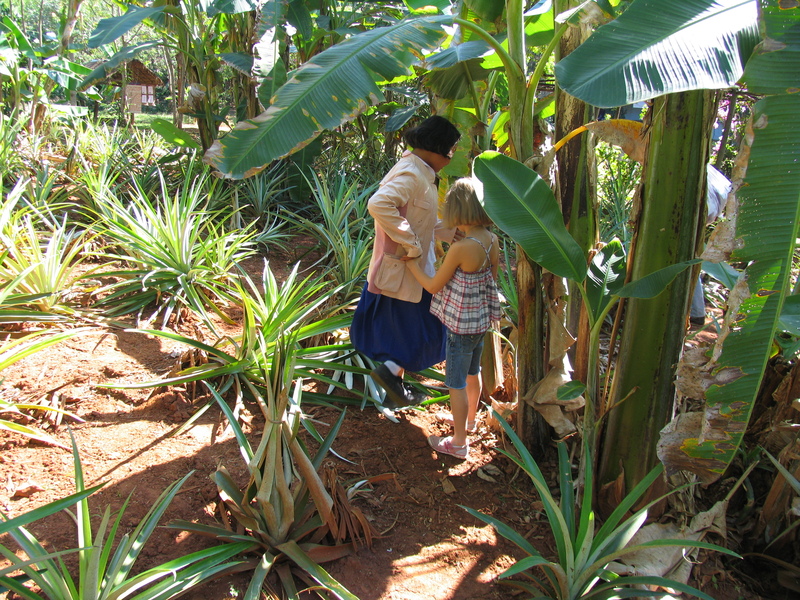 At the farm they have all kinds of fruits and vegetables on 20 acres. We picked some of them for our lunch on that same day. Here the kids learn more effective farming methods (most come from hill tribes that have to move every few years to new lands because of poor farming methods) and also have their own school and teachers. 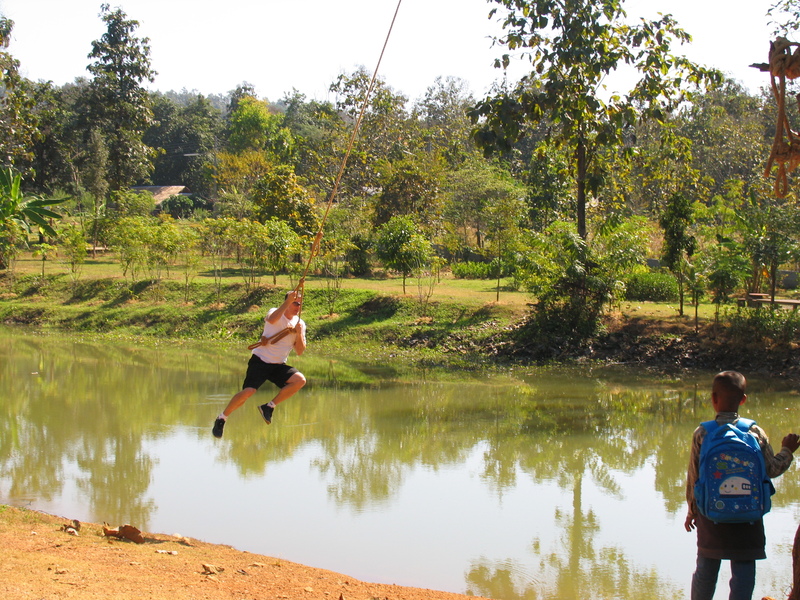 There is a rope swing over the lake that we all had to try. Kathryn and I made it safely, but Ebey and Emily suffered some scrapes on landing. 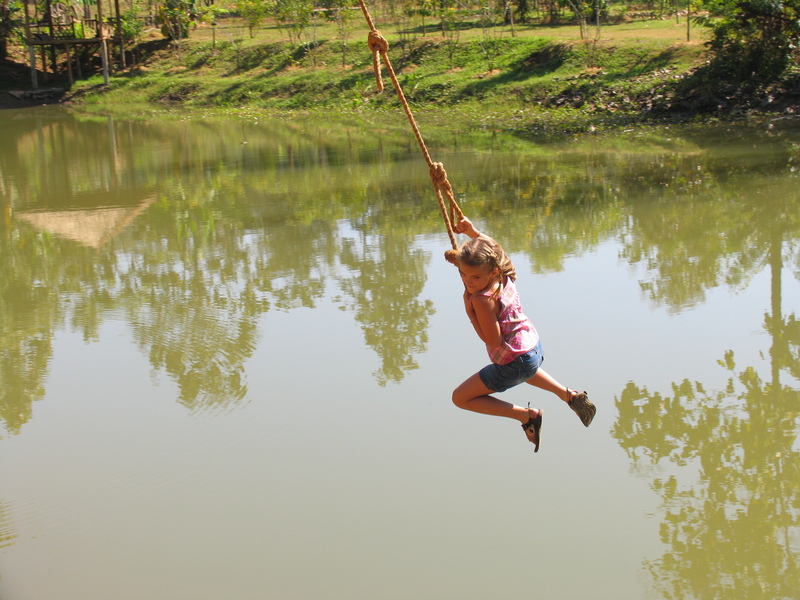 We didn’t let Emily go, thinking she was too small, but after everyone had left for lunch she insisted on doing the rope swing so we went back–just she and I to the rope swing. She held on fine, but hit the ground pretty hard in the landing. I was proud of her for her toughness. 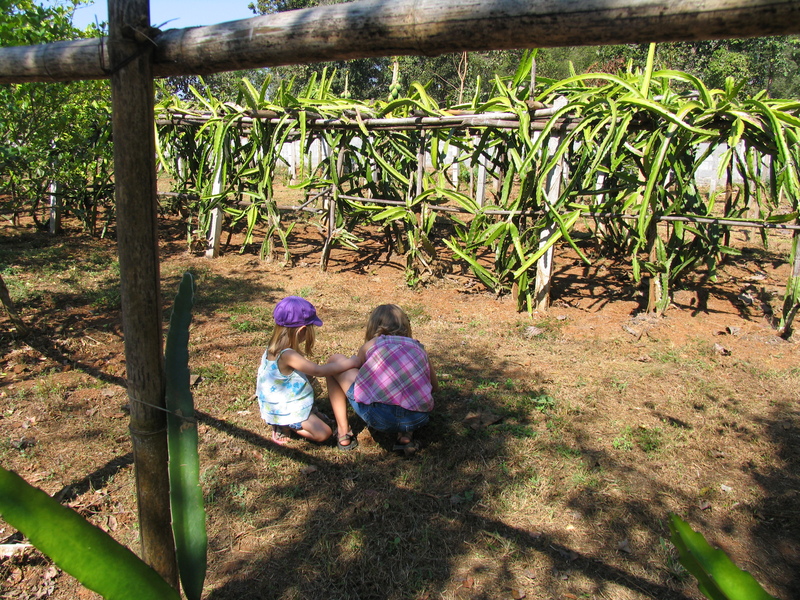 The kids saw lots of new plants that hadn’t seen and many others they had eaten, but didn’t know where they came from. That night we cruised around Chiang Mai for the last time, going on a long adventure in search for ice cream and ending at the famous Chiang Mai Night Bazaar. Chiang Mai ended up being different than I expected. I didn’t expect it to be so big with so much traffic. The number of Westerners also shocked me. Everywhere you looked there were other white people, with the accompanying businesses and services to accommodate them. 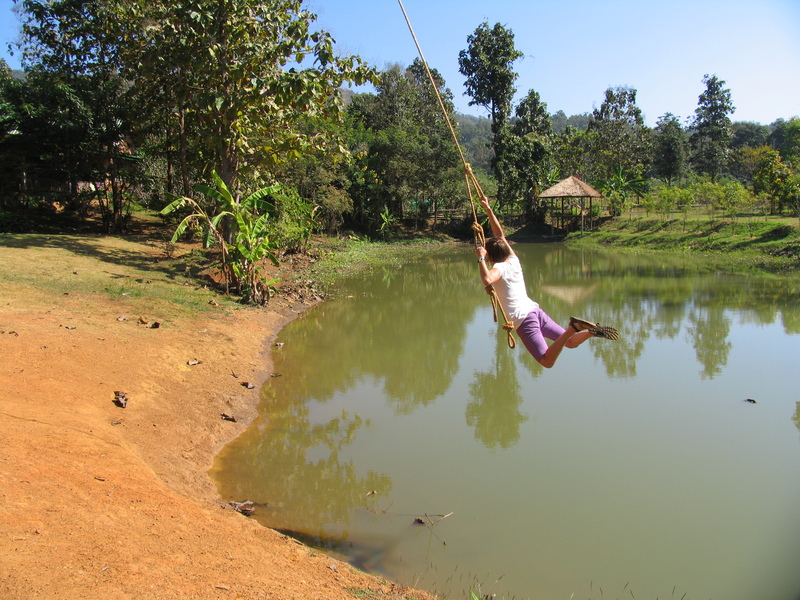 While we loved Chiang Mai, I think we hit it 20 years past its prime. There are certainly few things more hypocritical than a tourist complaining of a place being “touristy,” but I’m doing it anyway. Here, the culture of the Westerners and the tourism industry dominated more than in Bangkok where everyone blends together in regular life so much better. 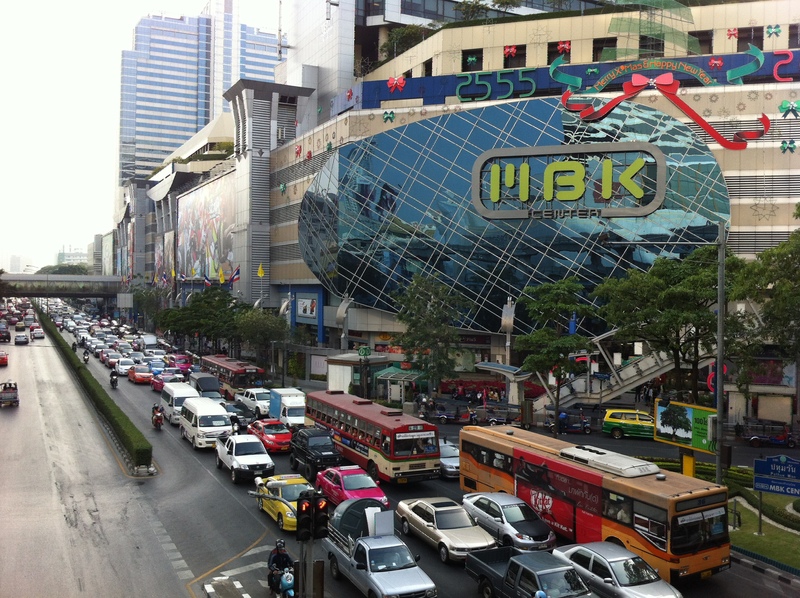 Bangkok is so massive that it has been able to absorb many Westerners and their culture without losing any of her own. Chiang Mai had been so isolated for centuries that it developed a very original culture but I’m afraid the remains of that culture are a bit overstated. The outskirts of Chiang Mai were stunning and I would certainly go back, but the image and expectations held in my mind would be far different next time.